Hi guys, I really need help, how do i fix my tab S.
At first, it was normal and everything is good. Then battery low. So i charge as usual. Then after 15 mins charging, it shows 100%. And battery starts jumping randomly, like 80% then became 21%, then back 65%, then critically low. And the major things happen, screen starts flickering white lines when i touch/swipe screen. Then the next day, screen still flickering white lines and keeps rebooting itself. I leave it till empty battery, hope it goes back to normal, still the sae.. Keeps restarting whenever the white flickering lines appear. I tried going recovery mode, wipe cache, factory reset. Still nothing. Even after data reset, at the start of the screen page, pressing 'next' next, it stills sometime flickers and restart again. Anyone got solution, or knows what happen to my tabS 8.4? Really appreciate it if helps. Bcos my warranty is expired. Tablet is a month old. Is it my battery, or charger or virus that cause it? If it was new, and a month old, it should still be under warranty. Try plugging it into a running PC for >5 hours to see if there is a change. It is possible you have a bad cable if that doesn't work but you should at least try a factory reset if it doesn't. If the reset doesn't work it may just be faulty, which is what I suspect based on your description. I did factory reset thru recovery mode wipe cache reboot system, still the flickering does happen and reboot itself. Sure, I will give it a try, the cable plug in to the PC, hopefully it helps, thanks. If it still flickers and reboot repeatedly, I will take a video of my tablet and post the link. If nothing Leeshor recommended works, I would still contact Samsung about the warranty. I'm guessing that they will forgive your not registering. Hi, I have the same problem with my Galaxy Tab S. Did you find a solution? I've also experienced the same problems. The screen displays bright flashing horizontal stripes, especially when refreshing: for instance when turning the display from landscape to portrait. After a few minutes it reboots. Also the battery charge goes from 60% to 0%, and when plugged in will jump to maybe 40 or 50% in a few minutes. The unit was completely unusable. I bought it in mid November 2014 and the symptoms started at mid February. It is still under warranty. I sent it to Samsung tech service almost 20 days ago and I haven't heard from them. Not the best hardware nor the best service I'd say. 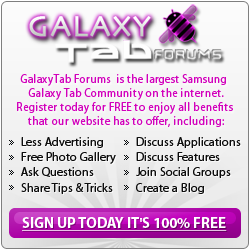 Welcome to the forum Jess, sorry about your problems with your tablet. Hope it comes back in great shape...and soon! I too have this very annoying unacceptable issue....I don't want to send mine in so I have been treating it like an Apple device and accepting it. I found it does NOT do it if I leave my tablet in Power Save mode. Not ultra just the regular one. The tablet is so fast that I don't see a performance hit. I've also moved to using the Next launcher. Tablet actually last for many hours of use and doesn't flake out when in Power Save. I have the Best Buy exclusive 32gb version. Boo on Best Buy but wahoo to 32gb. to fix the samsung galaxy tab S 10.5 or 8.4 with auto restart/rebooting, flickering horizontal lines. you have to RE-SOLDER the battery terminal! Same thing happens here Samsung has to fix this.